Please circulate this as widely as you can. I think it is even more massive than the issue of the DWP’s fake ‘psychometric test’. 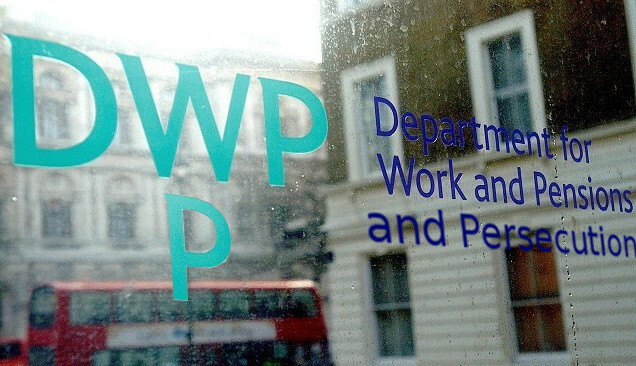 There has been much attention in recent weeks on the Dept of Work and Pension’s (DWP) ‘cruel and unusual‘ treatment of jobseekers. It has forced claimants to take fake online tests under threat of losing their benefits, and then denied it and admitted it in the same Freedom of Information response. It has arbitrarily sanctioned vast – and rapidly increasing – numbers of claimants, and looks set to impose the maximum penalties of up to 3 years on at least 100,000 people (and more likely 300,000 or more). Thanks to a tip-off from a reader, I’ve uncovered another in a seemingly endless line of reckless and unreasonable DWP behaviour – not to mention quite possibly illegal, as it must surely breach the Data Protection Act. 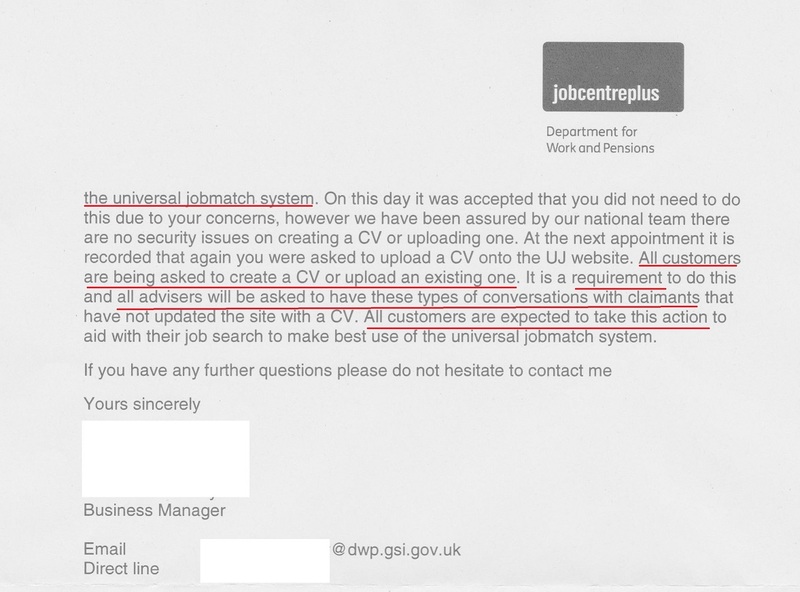 The matter centres around the DWP’s ‘Universal Jobmatch‘ (UJM) platform – a system that contains jobs for which jobseekers must demonstrate that they have applied. The use of this platform is routinely ‘mandated’ for claimants – in other words, made compulsory so that non-compliance will lead to ‘sanction’, the immediate cessation of benefits for a minimum of 4 weeks. UJM has a serious security flaw. Even if a user logs out of the system, the ‘cookies’ it stores are retained unless specifically deleted. If they are not deleted, the next person accessing the system can be logged on as the previous individual – and will have access to all the previous person’s personal information. Because of new requirements placed on jobseekers, this information does not only include the previous jobseeker’s job-search history, but all of their personal information including a full CV – which jobseekers are now ‘mandated’ to upload. This problem came to light after a mother who is a JSA claimant and has asked not to be identified, went with her son to the library (they don’t have a computer) and logged onto a public computer. Mum went first and used UJM, followed by her teenaged son – who was immediately logged on as his mother. Thank you for contacting Universal Jobmatch. We have checked our records and we can confirm that we only have your email address on our records. Therefore we suggest that you clear your cache and cookies, please refer to your browsers in line help if you need assistance to clear your cache and cookies. We hope this answers your query, if you need any further assistance please do not hesitate to contact us. Clearing cookies for a specific site is a possible, but time-consuming process if you are using your own computer – and difficult to complete reliably. But on public access terminals in libraries, community centres etc, users are barred from the necessary access to the browser options to be able to delete cookies and private information. As the above response letter (not email) also discloses, all jobseekers are required to upload their CVs to UJM, so failure to do so can be considered a breach and punished by a sanction of at least 4 weeks. So we have a situation in which Jobseekers are required to comply with an instruction which might put their detailed personal information at the disposal of complete strangers – and can be punished by the immediate suspension of their vital benefits if they do not, to the severe detriment of the claimant, their family and others. The DWP’s intrusion does not end with coercion to put personal information at risk of public exposure. I can also reveal that claimants are asked to give the password to their personal email accounts to their JCP advisor. The official reason for this is so that advisors can check whether acknowledgements have been received for online job applications a jobseeker claims to have made – but possessing someone’s personal email sign-in clearly leaves claimants open to serious abuse, from snooping to potential risks of blackmail or fraud. · Universal Jobmatch is a valuable tool for helping jobseekers find work, and already more than 2 million have registered to use it. The sheer volume of jobs posted on the site means that we expect the majority of claimants who are genuinely looking for work to use it willingly. Where this is not the case and where appropriate we may require some Jobseeker’s Allowance (JSA) claimants to create a profile and public CV. · Claimants are not required to accept cookies. If they don’t want to accept cookies on their own computer, then where possible they can use an Internet Access Device in their Jobcentre (by arrangement with their adviser). · Claimants are not required to allow DWP access to their account – it is entirely up to them – many choose to allow access because it enables their adviser to offer them more personalised advice and support. it tries to state that claimants are not obliged to accept ‘cookies’ to use UJM – but the only way to avoid this is to attend the Jobcentre Plus in person. it acknowledges that claimants are at least asked to hand over their private email log-ons to their advisors. Even if it is voluntary, it still involves the risk of snooping, blackmail and fraud, as well being deeply problematic in ethical terms – but in view of the contradiction with the ‘ground-level’ reality on uploading CVs, it is completely conceivable that my source’s claims are true: that claimants are being pressured into handing over their private account details. Since claimants are required to look for jobs daily, the proposed solution to avoid accepting the ‘cookie’ vulnerability would mean daily attendance at a JCP that might be miles away from a claimant’s home – thus involving significant expenditure by a person of low income, and drastically reducing the time available for job-seeking and the basic tasks of life. This is clearly not a realistic solution – so claimants are, in fact, effectively forced into a situation of either revealing extremely personal information or losing their benefits. And whatever the practicalities, forcing claimants to use a system that is known to contain a risk of revealing sensitive personal information – not to mention pressuring them to reveal their sign-in details – must surely be a breach of the Data Protection Act in all kinds of ways, and is therefore illegal. Once again, we see the DWP acting in a rogue, reckless and bullying way to infringe the rights and dignity of unemployed people – and don’t forget, there are about 500,000 jobs for over 2.5 million unemployed, so this is emphatically not a lifestyle choice. This department – following the example of its Secretary of State – treats vulnerable people with utter contempt and disregard for their rights and wellbeing. I will be sending this information to the Work and Pensions Committee with a request for its urgent attention on the matter. I ask and urge you to do the same, so that Iain (Duncan) Smith is finally held to account. The email address is workpencom@parliament.uk. The matter is also with the Information Commissioner’s Office, which seems to be taking it very seriously, and I await the ICO’s comments. I worked at a Jobcentre for 17 years. the majority people I worked with would be very unhappy about this coercion. I would have been sacked for noncompliance. Now I am disabled & have been treated badly, but not this badly. I agree, but no-one is going to be sacked if they follow the all the rules including the DWP Values and the COP. I am sorry you have been treated badly as a disabled person – I have felt the same. I was listening to a hearing by the Administration committee yesterday about ‘complaints and do they make a difference’ and was interested to hear the chair state “it is always the vulnerable people who suffer if the government fails”. He also picked up that there can be a culture of denial and there is no central collation of complaints by the minister. This means the DWP do not know what is going on in their offices unless a person complains to ICE or the Ombudsman. For obvious reasons Jobcentre Plus like to deal with complaints locally if they can! There is information regarding the extraordinary high level of appeals taking place and claimants are winning over 42% of those cases, which provides further proof to the tax payer that DWP makes very poor decisions indeed and many of their decisions are irrational. This success rate would be much higher if all claimants sought professional help. However, if DWP made rational decisions and were not driven by unlawful targets/measures there would be fewer appeals as well as physically and mentally damaged people who are caught by the very harsh sanctions. In my view these decisions are neither rational or proportionate for the the alleged ‘crime’. It was determined by as select committee in 2010 that it was not proportionate to sanction someone for failing to attend a short 1 hr Back To Work session for 2 weeks and it was reduced to one, but now people are being sanctioned for 4 weeks for attending the same event (now called a non-mandatory group information session!) that MPs determined as unfair only 3 years ago! Could you let me have some more info by email on the sanctions for not attending a non-mandatory session? I feel this is a disgrace to the community. At first I found the UJM system quite good, but now, despite of it being mandatory, there are less jobs in the system, and that really reduce my chances of finding something suitable, because there was insufficient choices due to the longer distances. We have all known since before Christmas that Universal Jobmatch is unsafe and puts jobseekers at risk of identity theft (among other perils). The latest Skwawkbox article reveals the latest Catch-22 situation faced by Jobseekers, who may be mandated to leave their personal details open to anyone using the same public computer terminal as them, if they don’t have a computer at home. Of particular concern is the attempt to coerce jobseekers into letting Jobcentre Plus staff have access to their email accounts. Big Brother (or Sister) really will be watching you if you’re bullied into letting that happen! And who knows what they might do with the emails they discover? 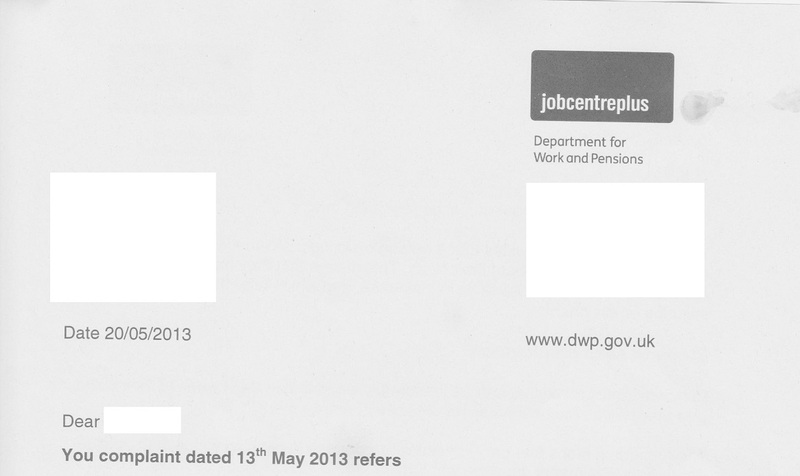 Who needs the Snooper’s Charter when the DWP is reading your mail? I was at a new claimant 1st appont at JC today and refused to give the advisor an email address so she could log me in to UJM after asking if it was mandatory. She said it wasn’t mandatory as yet but I would be when I had completed the two years with my Work Provider. She wasn’t very happy that I refused and tried to bully me into logging in so I could upload a CV. I’m probably targetted for a sanction at first opportunity now. I’d also advise people to get a throwaway gmail account if they are pressured into signing up for this garbage. If enough of us report this to them as well as emailing the Work and Pensions Committee as you suggest, then maybe something will get done about it. So come on everyone, lets gets emailing and stop this Orwellian nightmare from getting worse. Most of the managers do not belong to a union and many from my experience do not understand their departments own rules or add their own interpretation. If staff adhere to the DWP values, the civil service code of practice and use their own internal moral barometer, claimants would never be treated like this. The Wednebury rules should not be breached either. This is what judges use to determine if a public authorities oversteps their authority and basically it means not to behave irrationally. Checking whether officials know the Wednesbury principles, which underpin in law their decision-taking, has been depressing. Anecdotal evidence is that some have not heard of the case of Associated Provincial Picture Houses Ltd v Wednesbury Corporation (1947), which set down the standard of unreasonableness of public body decisions that render them liable to be quashed on judicial review. Officials’ decisions must take into account all relevant facts, ignore irrelevant facts and be rational. week sanction is disproportionate in relation to the duration of the session, and as such propose to reduce the period of sanction for failure to attend this session to one week. Thanks for that – I’ll take a look at the link asap. This letter contradicts DWP’s own policy and guidance as well as a letter issued by Neil Couling, the Work Service director which I will email to you. Furthermore, using shared WFI is not recommended by the banks when uploading or accessing private information. Local libraries and other centres will no doubt be using shared WFI. Jobseekers can book an appointment to use the Jobcentre’s own machines and can claim their expenses for doing so. The downside is, from my experience the machines are often located in a public space where people can see all your details or they are located very near the front door, which is very drafty and you will soon get a very painful neck or back if you spend much of your day (which is now a requirement) to seek work in the Jobcentre environment! In my local office there are currently 4 machines, but 3,500 claimants! Tips on using shared WFI in public places. Do not forget to log off if use a Jobcentre IAD. This will take a long time to read! I asked about the cookies on the library computers with my local library tech guy. He told me that once you log out completely from your session on the public network all cookies are deleted. I’m not techie but could the mother and son been using the same library account session, i.e one signed onto the computer, did their UJ job search, signed out of their UJ account but not their library account session, next one signed on to their UJ account and the cookies were still in place as they were still using the same library account. Several months ago I was informed by the Jobcentre I had been attending that an online job-serach record was not compulsory but a new option. It was meant to be easier. I did not want to have my personal details online so I said I would rather continue with the paper record version. However, when I logged into the Job-centre website I could no longer look at jobs that were available without registering for the online account. By this method I was forced to partake. Now, all my personal details, including CV with address, work history etc are online and readily accessible by any Jobcentre staff and given the reason PRISM scandal, God knows who else!! Yes. The DWP’s claim that it’s voluntary is patent nonsense. Thanks for sharing your experience. At present there is a ‘choice’ as to whether you can allow your CV to be viewed (via UJM account) by anyone who signs up as a potential employer. Given the increasing number of scams beginning to surface online (also via UJM) it is strongly recommended that people choose the more private option of sending CV with applications only. The only way personally round this whole problem of privacy is to use an entirely separate email account (and separate IP address and location) with no links at all to my main email account which is also totally separate from the email account for social media. I have no idea if this is enough and am paranoid enough to suspect it is woefully inadequate. Having recently been a JSA claimant for a month and a half, I’m glad I never came across any attempts to ask me for access to my personal email account. I did use UJM here and there but found jobs on it that should never have been there (public sector jobs that require lengthy, person specified direct applications through an employers own portal) and still allowed for a one click application that would just send a CV to the employer. This of course would be rejected outright in such sectors. I ended up using respectable job websites and taking printouts of application confirmations with me to my signing on appointments. My experience of the ‘account access’ and the way the DWP response reads, is to allow JobCentre Plus advisors to access the claimants UJM account to see their activity. I’m not saying that the ‘coerscion to access personal email accounts doesn’t got on, I can entirely believe it, but I’m not sure the DWP response you posted actually applies to that. It does tie in with the advisor access to a UJM account and they don’t need a password for that, just the email address that you used to register. You also had to have ticked the option during your account setup to allow an advisor to access your activity. I’m a big supporter of yours Steve, I think you should maybe try and investigate this ‘access to personal email account’ thing a bit more before tying DWP responses to it, the last thing you need is to give them ammunition to come back at you. Hi mate, thanks for the comments. My question to the DWP was not about access to a UJM account but specifically about claimants being asked for their personal email account details and the response about account access was the result. You have made a very good point if you can prove there more effective ways to find the jobs you are seeking there is no requirement for you to use UJM. I would recommend that Jobseekers do not give their consent for DWP to access Jobsearch activity, because this might lead to a sanction if they think you should have applied for certain jobs and you didn’t! Agree in principle, but do all advisors know and remember that? Given the ease with which sanctions are imposed, I fear that there would be many cases of arguing for more effective options being taken as unwillingness/non-compliance and ‘punished’ accordingly. Passed on to EL REG – hopefully the vulture shall descend upon this story with e force it requires. It is easy to prove by printing out the vacancies from UJM and comparing the opportunities on other sites. As an employer I have tried every method of advertising for staff. I decided not to the use the Jobcentre site as there are better alternatives for my business needs. 🙂 I am sure this is the case for other industry sectors too. A caveat to my earlier advice, always have the evidence to support your case. It’s kind of a problem that it’s so easy to apply, if the apply button works, and there are so few jobs and it’s compulsory to apply for a certain number. Every single one nearly is self-employed catalogue sales person, round here, or self-employed home-care worker own car, which i don’t have. So i end up spamming employers for jobs i’m not remotely suitable for, feeling guilty. Sometimes their adverts include the plea to not advertise if you don’t have the right skills etc. Many people do not realise that jobs feed from one site to another. I found this Job on the Indeed site (one of the sites I use), which has fed through from UJM. In this instance you need to create a UJM account to apply, but I am certain this vacancy will be found on other more relevant sites, for example Jobs go Public, The Guardian or the local council website and will have a much easier application method. 2. you do not need to give the jobcentre access to your account (you need to tick a box). They ask for your email address (and not password) so they can find your account. I had a bit of resistance (how can we verify your job searches etc) and when I wouldnt budge on not giving them access they relented. 3. However they no longer give out the paper booklets or pages in an attempt to force people to record all their job applications via the site. I still persist in writing mine out. 3. I am experienced in my field and I have never received an email or call or acknowledgement from any of the jobs I have applied via their site. It is frankly a waste of time. 4. I asked my advisor about the targets and I was told that yes they did exist, and they do so now although not as obviously. The advisors are asked mockingly whether all their claimants really did do their job searches, which apparently the answer is no. They do feel under pressure to sanction claimants. 5. you have to be a bit wary of them, but I have been treated OK overall and the team seem quite nice. I am told this is because I am a newish Claimant and I am a professional. Oh, except for when I first went in, the lady was so rude to me and basically said I chose to be there (I had just lost my job!) that I was in tears by the time I left. My own experience last time I was unemployed is similar. Rude and dismissive until they realised my background and skills, then a complete turnaround. I wonder how many DWP staff can translate “Therefore we suggest that you clear your cache and cookies, please refer to your browsers in line help if you need assistance to clear your cache and cookies” into plain English. The technical risks here are perhaps mitigated by the fact that a decent (!) library Internet terminal should use “guest mode” and thus delete all cookies when you end your session. But it’s still crap software design, and the contents from DWP staff reveal the fundamental disconnect between their view of the world (where everyone already has lots of computer skills, because everyone has a job) and the reality of the vulnerable. It’s fantastic that government services can be readily accessed via the web, but there’s always going to be a need for a manual alternative for the poor, weak, and disabled. Except of course that this government sees them as convenient scapegoats, not human beings. Our library already runs digital skills classes but just don’t have the space for everyone who needs help. This is a huge problem. Ffion, that’s brilliant information – thank you. I’ve been considering a post for a while on the effect of the ‘online-only’ aspects of the new Universal Credit, so it’s relevant for that as well as for jobseekers. Is there a professional body for librarians that I could contact for a wider comment as well as using yours? I wrote the blog post that Ffion referred to above…I blog quite regularly on digital divide issues as I feel it is crucial not just in terms of my profession but in terms of society as a whole. I am also a founder member of Voices for the Library and, whilst we are not a professional body, we do campaign for libraries and librarians and would be happy to contribute a wider comment should it be desirable. Brilliant, it’d be great to get a wider view. Could you email me a comment at ccgwatch@gmail.com, along with a number to follow up if I need any clarifications? No worries, saw the connection between this and what Ian comments on – thought it’d come in useful! Digital exclusion, as you rightly point out, is definitely a big problem and I wonder if the DWP have considered the problems that disabled jobseekers might face accessing the UJM system. Blind and visually impaired people, for instance, even supposing they had any experience of computers and the speech recognition software they need for access could find the system itself inaccessible to their software since often it cannot read complicated pages with lots of frames (not sure of the correct terminology). A blind friend of mine can’t access many websites because of this problem. And if such a jobseeker had no computer of their own, its unlikely that library computers or the ones in Job Centres have the software installed anyway. Will these people then be sanctioned for failing to use UJM? Some good info for Jobseekers, to hep prevent sanctions. Universal Jobmatch – No help for the unemployed! At last a claimant is taking legal action against DWP! Could you take her name out as well, please? Thanks! I was santioned for not signing up. I wrote to my MP. UJM would help me. Apart from the usual it will help everybody – which is a blanket approach – which goes against their own guidance. Brilliant! If you wouldn’t mind dropping more details to me at ccgwatch@gmail.com I’d love to write it up so others know to do the same! I’ve emailed you with details of someone who should be well-placed to help, mate. i have recently been FORCED to hand over detials of email address etc to the job center, according to the advisor there they were now classed as my “EMPLOYERS” and as such i was to do exactly as told as well as hand over all of my bank details including at least 2 months statements otherwise i would be stopped from recieving any benefit at all, is this even legal, even the police cant access my bank statements without my say so cant they???? I have a contact who can advise on that. Email me at skwalker1964@gmail.com with more details and I’ll check for you. If you have anything in writing, send me a scan. This is no way to treat decent honest people. Even if it turns out to be true that the JobCentre is classed as your employer, Barry,this advisor should be sacked for implying that any employer has the right to access your private stuff. It reveals a great deal about the attitudes of IDS etc who seem to think that only those with enough money not to need help from the state are worthy of full human rights. I shudder to think what would happen if Cameron gets his way and scraps the Human Rights Act. I have one email for work, in the sense, job applications etc, another for personal use – actually i have about fifty, but i only regularly use 5 of them. May I draw your attention to this FOI answer; “”A3. Claimants will not be mandated to use IADs available in Jobcentre Plus offices and will, therefore, not be sanctioned if they refuse to use them. Use of IADs by claimants is voluntary.” https://www.whatdotheyknow.com/request/173127/response/422728/attach/html/3/FOI3884%20Gazz%20WDTK%20Reply.pdf.html That’s from the 22nd of August. It appears then people can’t be mandated to use UC either at home (cookie law) or at jobcentres. They said no one was mandated to do the fake psych test, and that turned out to be completely untrue. The system is set-up to force people to comply with whatever they decide to impose, whether it’s legal or not. Big Bill that reply has already been disputed in one other more recent FOI response and it is probably wrong…although there are other FOI requests still to be answered asking for clarification. However, there is one certainty and that is that you do not, under any circumstances have to reveal your email address, telephone number or CV to the Jobcentre to be eligible for JSA and can’t be mandated to provide them. Therefore, as both Government Gateway and UJM both require you to enter your email address it follows that you can’t be mandated to register with UJM. And that’s just one of many reasons you could use to reasonably refuse to register. I’m watching it. It seems to me to make FOIs pointless if wrong answers can be given, which is another story in itself. The problem is, though, that under the new rules it doesn’t matter whether they can legally make you do something. It only matters if your JCP adviser THINKS they can – and then decides to sanction you for not doing what s/he thinks you’re supposed to do. If one of his/her colleagues is equally ill-informed – that’s it. No right of appeal beyond that initial request for review. That’s not so skywalker. There will be a change to the appeals process in October whereby any decision you disagree with has to go through a mandatory reconsideration before you’re allowed to proceed to the tribunal stage. The mandatory appeal involves a decision maker telephoning you to discuss the decision. You are right though that initially we do appear to be at the mercy of our untrained and often biased adviser and then their mates at the Jobcentre. But while this continued watering down of the few rights we have continues they still cannot change the fundamentals and, in this instance, whether they like it or not we don’t have to give them our email address and so can’t be made to register with UJM. The ‘no right of appeal’ was provided to me by a DWP insider. Other decisions can be appealed but the appeals process appears not to apply to this specific circumstance. Hmmm…well the official DWP word as provided in the link I gave makes no mention of the claimant commitment being exempted from the appeal process. against a decision to impose a sanction. Pensions within one month of receiving the decision. why they are asking for a mandatory reconsideration. So, apparently, we never had the right of appeal anyway, so nothing’s changed. OK, I think I see what’s going on now. With the JSAg we have the right to refer any variation that the adviser wants to make, and that we disagree with, to a decision maker. Once the DM passes his judgement you have 21 days to sign the JSAg or your claim gets stopped, but in the meantime we still get paid JSA. Now, with the claimant commitment, you can only have anything you’re unhappy about reconsidered by another adviser in the same Jobcentre and if they insist on it being included on the CC you then have ‘up to’ seven days to agree or you risk being sanctioned. You then have the right to a mandatory reconsideration by a DM and then a tribunal if necessary. So our right to question our agreement has been reduced from 21 to 7 days and only gets looked at by another Jobcentre adviser in the first instance rather than a DM. It clearly weakens our position as far as questioning what is put on our agreements but there is still an appeals process. When i created my account, it was a bit of a shock to see it immediately link to all my details on my passport and driving license. That is, every single detail, photo & passport number included. Slightly larger than average risk. 2. Click ‘start new private browsing session’. This will automatically delete all your cookies & cache. It’s on every browser. General life advice: move to Wales. The jobcentre staff help you against the system and genuinely care. They were lovely in Shrewsbury too, but i moved before this lot came in. After making a new claim recently, I too was asked for the password to my email account, to which I laughed and muttered 2 words, the second being off and I explained data protection to him. On the next visit I was asked for my UJM password so he could sync his system to the clients data, he got the same response as before and after a lengthy chat with him and some others, THE THING WE HAVE TO DO IS CHECK THE BOX IN THE SETTINGS TO ALLOW THEM ACCESS (I had to point this out to them, they didn’t even know about it at the time) but still this does allow any DWP staff member access to it, well all those with access at whatever level its restricted too. I did cave in in the end but I don’t like it at all! As for the signing into public systems. I own a pc so the way around this problem is sign in only at home, if placed on any course or mandatory “use the PC’s at the job centre day” I never sign into anything, only search the sites and make notes, I was told I had too but when I pointed out that I could not personally delete the history/cookies so I’m not leaving any of my personal details on your ridiculously restrictive system, I am clearly looking for work and writing down any I can apply to from my home PC, I was left alone after that. How many people are unemployed 2.49 million, how people does It take to start a revolution 2.49 million then lets have one. The bit I don’t get is why people give them permission to access their account . It’s simple refuse , believe it or not under the data protection act they need your permission to access your account . when you open an account you will notice a box for you to tick that says give DWP access ,so don’t tick it and it locks them out . when the advisor asks say I don’t store data in the account as I don’t trust the site and only us it for job search and yes I do have a cv live on there , after that there is nothing they can do . yes , they will try a few strong arm tactics to get you to give permission , but think of it like this , why are they asking for your permission – because you have the right not to give it to them . They get annoyed because it means they cant spy on you , but they only want to use it to stop your benefits . They will come out with psychological mind games like we see it as you refusing our help to find work , because we could save jobs into your account , to try make you think you could get sanctioned but its all empty threats . Just say if you have a job for me , you have my number give me a ring , that’s what I do and the phone has never rung yet. Good luck all .